Are We Slowing Down The Age Clock? The rate of biological aging appears to be more delayed for all Americans - particularly men - which may extend their lives, says recent national heath data. Researchers cite advancements in medicine as one possible reason for the deceleration. A new study by University of Southern California and Yale University researchers suggests that at least part of the gains in life expectancy over recent decades may be due to a change in the rate of biological aging, rather than simply keeping ailing people alive. "This is the first evidence we have of delayed 'aging' among a national sample of Americans," says senior author Eileen M. Crimmins, University Professor and AARP Professor of Gerontology at the USC Leonard Davis School of Gerontology. "A deceleration of the human aging process, whether accomplished through environment or biomedical intervention, would push the timing of aging-related disease and disability incidence closer to the end of life." Using data from the National Health and Nutrition Examination Survey, the researchers examined how biological age, relative to chronological age, changed in the U.S. while considering the contributions of health behaviors. Biological age was calculated using several indicators for metabolism, inflammation, and organ function, including levels of hemoglobin, total cholesterol, creatinine, alkaline phosphatase, albumin, and C-reactive protein in blood, as well as blood pressure and breath capacity data. While all age groups experienced some decrease in biological age, the results suggest that not all people may be faring the same. Older adults experienced the greatest decreases in biological age, and men experienced greater declines in biological age than females. These differences were partially explained by changes in smoking, obesity, and medication use. "While improvements may take time to manifest, and thus are more apparent at older ages, this could also signal problems for younger people, particularly females, who - if their improvements are more minimal - may not see the same gains in life expectancy as experienced by the generations that came before them," added lead author Morgan E. Levine, assistant professor at the Yale Center for Research on Aging. Slowing the pace of aging, along with increasing life expectancy, has important social and economic implications. The study suggests that modifying health behaviors and using prescription medications does have significant impact on the health of the population. "Life extension without changing the aging rate will have detrimental implications, Levine said. Medical care costs will rise as people spend a higher proportion of their lives with disease and disability. However, lifespan extension accomplished through a deceleration of the aging process will lead to lower healthcare expenditures, higher productivity, and greater well-being." Heavy drinking and smoking are linked to visible signs of physical aging, and looking older than one's years, says research published in theJournal of Epidemiology & Community Health. Light to moderate drinking was not associated with biological aging, the findings showed. Nor was it linked to the slowing of the visible aging process as there was no difference in the prevalence of the signs of aging between light to moderate drinkers and non-drinkers. They base their findings on information from more than 11,500 adults, whose heart health and visible aging signs were tracked for an average of 11.5 years as part of the Copenhagen City Heart Study. This study, which began in 1976, has been monitoring a random sample of Danish people over the age of 20 living in the Copenhagen area from 1981 to 1983, from 1991 to 1994, and from 2001 to 2003. Participants were quizzed about their lifestyle and general health and asked how much they drank and smoked. They were also checked for four signs of aging that have previously been linked to a heightened risk of cardiovascular ill health or death - earlobe creases, a grayish-opaque colored ring or arc around the peripheral cornea of both eyes called arcus coneae, yellow-orange plaques on the eyelids called xanthelasmata, and male pattern baldness. The average age of the participants was 51, but ranged from 21 to 86 among the women, and from 21 to 93 among the men. Average alcohol consumption was 2.6 drinks per week for women and 11.4 for men. Just over half the women - or 57 percent - and around two thirds of the men 67 percent - were current smokers. Arcus coneae was the most common sign of aging among both sexes, with a prevalence of 60 percent among men over 70 and among women over 80. The least common sign was xanthelasmata, with a prevalence of five percent among men and women over 50. A receding hairline was common among men, with 80 percent of those over the age of 40 affected. Analysis of drinking and smoking patterns revealed a consistently heightened risk of looking older than one's true age and developing arcus coneae, earlobe creases, and xanthelasmata among those who smoked and drank heavily. For example, compared with a weekly alcohol intake of up to seven drinks, a tally of 28 or more was associated with a 33 percent heightened risk of arcus coneae among the women, and a 35 percent heightened risk among men who had 35 or more drinks every week. Similarly, compared with not smoking, smoking one pack of 20 cigarettes daily for between 15 and 30 years was associated with a 41 percent heightened risk among women and a 12 percent heightened risk among men. The occurrence of the visible signs of aging was no different among light to moderate drinkers than it was among non-drinkers. Male pattern baldness was not consistently associated with heavy drinking or smoking, possibly because it is strongly influenced by genes and circulating levels of male hormones. This is an observational study so no firm conclusions can be drawn about cause and effect, particularly as the data on smoking and drinking relied on personal recall, which is subject to bias. And while the researchers took account of a range of potentially influential factors, they were unable to take account of stress, which is associated with cardiovascular disease risk, smoking, and heavier drinking. This is the first prospective study to show that alcohol and smoking are associated with the development of visible age-related signs and thus generally looking older than one's actual age. This may reflect that heavy drinking and smoking increases general aging of the body. Recent research published inMolecular & Cellular Proteomics offers one glimpse into how cutting calories impacts aging inside a cell. 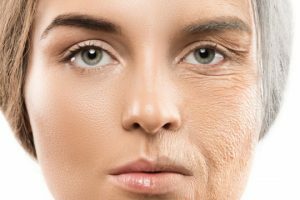 The researchers found that when ribosomes - the cell's protein makers - slow down, the aging process slows too. The decreased speed lowers production but gives ribosomes extra time to repair themselves. "The ribosome is a very complex machine, sort of like your car, and it periodically needs maintenance to replace the parts that wear out the fastest," said John Price, Brigham Young University biochemistry professor and senior author. "When tires wear out, you don't throw the whole car away and buy new ones. It's cheaper to replace the tires." So what causes ribosome production to slow down in the first place? At least for mice it is reduced calorie consumption. Price and his fellow researchers observed two groups of mice. One group had unlimited access to food while the other was restricted to consume 35 percent fewer calories, though still receiving all the necessary nutrients for survival. "When you restrict calorie consumption, there's almost a linear increase in lifespan," Price said. "We inferred that the restriction caused real biochemical changes that slowed down the rate of aging." This research team isn't the first to make the connection between cut calories and lifespan, but they were the first to show that general protein synthesis slows down and to recognize the ribosome's role in facilitating those youth-extending biochemical changes. "The calorie-restricted mice are more energetic and suffered fewer diseases," Price said. "And it's not just that they're living longer, but because they're better at maintaining their bodies, they're younger for longer as well." Ribosomes are expensive and important. They use 10 to 20 percent of the cell's total energy to build all the proteins necessary for the cell to operate. Because of this, it's impractical to destroy an entire ribosome when it starts to malfunction. Repairing individual parts of the ribosome on a regular basis enables ribosomes to continue producing high-quality proteins for longer than they would otherwise. This top-quality production in turn keeps cells and the entire body functioning well. Despite this study's observed connection between consuming fewer calories and improved lifespan, Price assured that people shouldn't start counting calories and expect to stay forever young. Calorie restriction has not been tested in humans as an anti-aging strategy, and the essential message is understanding the importance of taking care of our bodies. "Food isn't just material to be burned - it's a signal that tells our body and cells how to respond. We're getting down to the mechanisms of aging, which may help us make more educated decisions about what we eat." People who have a healthier diet throughout their adult lives are more likely to be stronger and fitter in older age than those who dont, says a recent study led by the University of Southampton. Scientists from the Universitys Medical Research Council Lifecourse Epidemiology Uni looked at the dietary patterns of a group of 969 British men and women whose lifestyles have been monitored since they were born in March 1946. Using information collected at four points in their adult lives - between 36 and 60 to 64 years - they examined diet at different ages in relation to three standard measures of physical function at age 60 to 64 - chair rise, timed up-and-go speeds, and standing balance. The study, published inThe Journals of Gerontology: SeriesA, is one of the first to look at the long-term benefits of healthier diets across adulthood for physical function in older age. It showed that those who ate more fruits, vegetables and wholegrain cereals, and fewer highly processed foods, across adulthood performed better in the three tests of physical function in older age. In addition, the study found evidence of better performance in two of the measures - chair rise speed and standing balance time - among participants whose quality of diet had improved across adulthood. Improving the quality of your diet can have a beneficial effect on health whatever your age, says Sian Robinson, lead author and Professor of Nutritional Epidemiology at the University of Southampton. However, this study suggests that making good dietary choices throughout adulthood by cutting down on highly processed foods and incorporating more fruits, vegetables and whole grains into your diet can have a significant beneficial effect on strength and physical performance later in life, helping to ensure a much healthier old age. The link between dietary patterns and frailty in older people will open the door to effective interventions against the age-related decline in musculoskeletal function, which is such a growing cause of disability in aging populations worldwide.